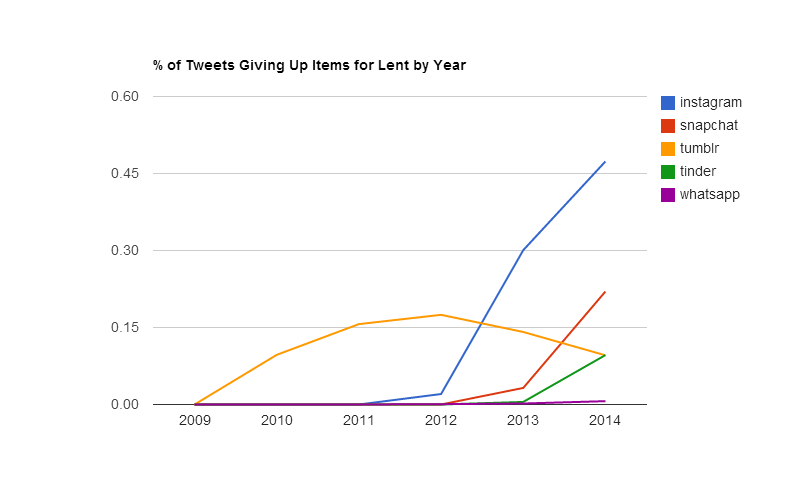 This year, “School” topped the list of things Twitterers are giving up for Lent, up 44 places from last year. Remaining in the top ten from last year are Swearing, Alcohol, Soda, Social Networking, and Fast Food. 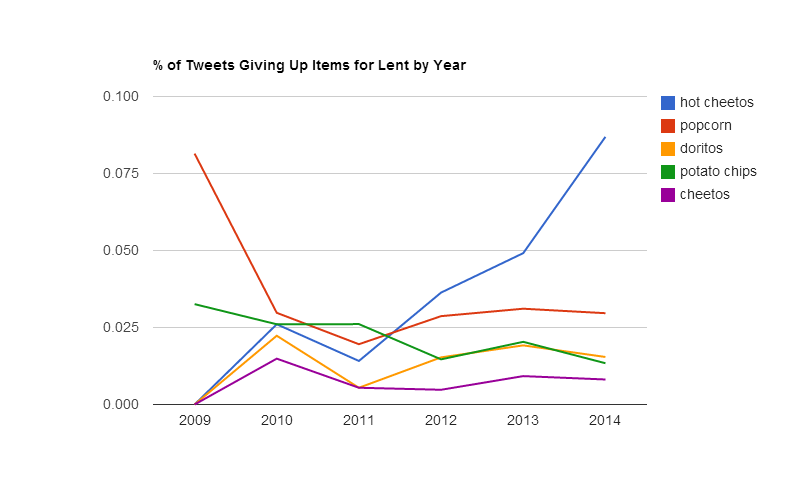 Chocolate, Twitter, Sweets, and Lent round out the new additions to the top ten. I don’t have a great explanation for why School is #1 this year–it could be that Ash Wednesday is later this year, so spring break is closer (for some it even starts today). It’s also possible that Twitter’s audience is skewing younger than it used to, or that younger Twitter users are more likely to tweet about Lent. Timely topics this year are Boosie, referring to rapper Lil Boosie, who was released from prison this week (people joked that the prison was giving him up for Lent); and Electricity, referring to a widespread power outage in South Africa. 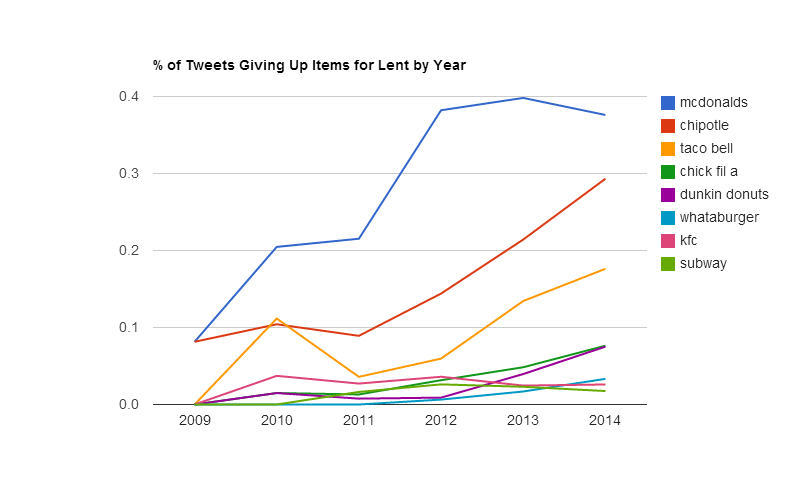 This list draws from 646,000 tweets during March 2 to 8 that mention giving up something for Lent and excludes retweets. This year I added a new Historical Lent Tracker that you can use to investigate Lenten trends on your own over the past six years. Tumblr peaked in 2011, and WhatsApp, which Facebook recently paid $19 billion for, doesn’t register highly. Chipotle is much higher on the list than I expected–is that because people love it or because they hate it? Congratulations, Hot Cheetos, on being the snack the most people want to give up. 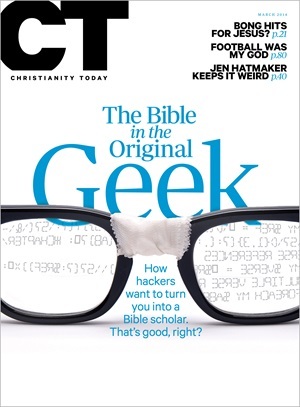 This month’s Christianity Today cover story, The Bible in the Original Geek, talks about how programmers are using technology to change how we read, study, and interpret the Bible. If you’re interested in the Bible and technology (and if you’re reading this blog, you probably are), then you should go read it. The article talks about the “academic priesthood,” and I think it’s particularly interesting that so few universities are interested in “digital theology” (for lack of a better term). You can study at Durham (like John Dyer is) or King’s College London, or you can try to work a biblical emphasis into a digital rhetoric Ph.D. But I’m surprised that more institutions, especially evangelical seminaries, aren’t at the forefront of the kind of research described in the article. 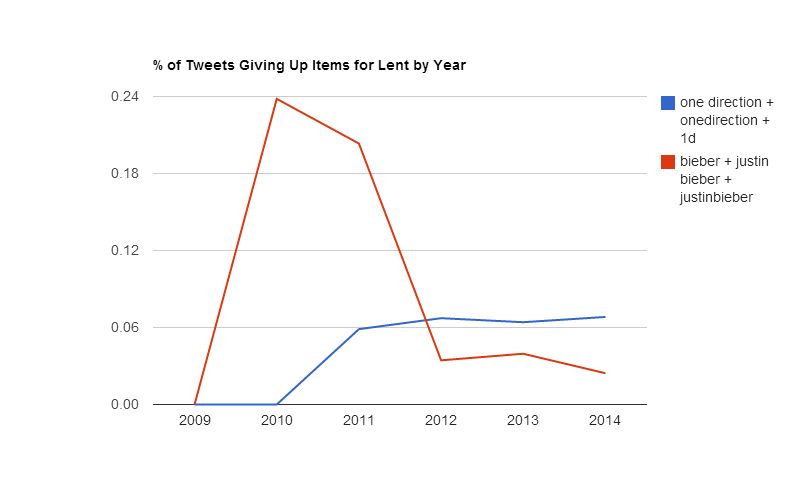 See the top 100 things people are giving up in 2014 for Lent on Twitter, continually updated until March 7, 2014. Look for the usual post-mortem on March 8, 2014. You are currently browsing the OpenBible.info Blog blog archives for March, 2014.